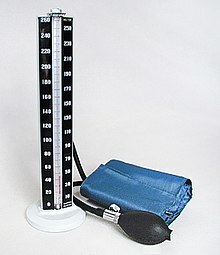 A sphygmomanometer ((/ˌsfɪɡmoʊməˈnɒmɪtər/, SFIG-moh-mə-NOM-i-tər; also called a blood pressure meter, blood pressure monitor, or blood pressure gauge) is a device used to measure blood pressure in humans. It was first invented by an Austrian physician in 1881. They now come in different shapes and sizes. They can be found in many places. The sphygmomanometer works by wrapping a tube of fabric (called a "cuff") around the arm or other body part. The cuff is filled up with air. That stops the flow of blood in the arm. The air is then released slowly until the blood flows again. The whole process, from start to finish, only takes about a minute. Many sphygmomanometers are inflated by squeezing a bulb. A gauge shows how much the cuff is inflated. The gauge can be mechanical or hydraulic (filled with mercury). It is important that the cuff is not inflated too much, so whoever is using the device has to use a stethoscope. Some sphygmomanometers, especially those that people use at home, are automatic. They inflate using an electric pump. They show the blood pressure on a screen. They are meant to be very easy to use. This page was last changed on 28 April 2017, at 16:12.